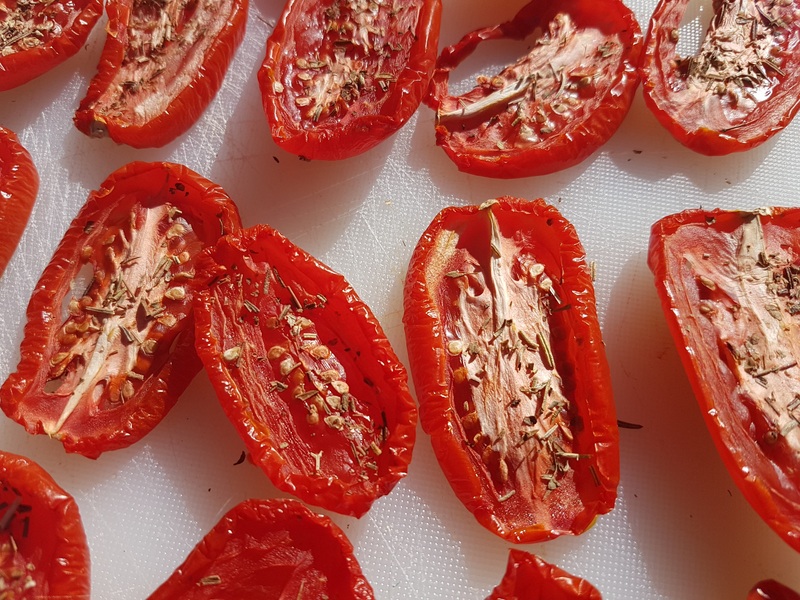 Every year when we visit the South of France, I sun dry tomatoes, and while the plump, ripe and halved plum tomatoes sit under the sun’s rays for a couple of days, I mull over the options for preserving or consuming them when they reach my preferred level of dryness. I tend to call a halt to the process before reaching the truly leathery feel of shop-bought sundried tomatoes, preferring to go for the still slightly squidgy feel where it’s clear there is still some ‘juice’ inside the shrivelled, red exterior. This year I just bottled my dried tomatoes, stuffing them into a jam jar with a teaspoon of herbes de provence and then topping them with enough extra virgin olive oil to cover the entire contents. Our stays in France of a summer come to an end all too soon and the sun-drying opportunities in Dorset are few and far between. Arriving home in mid-August this year, with tomatoes finally ripening locally, I was keen to dry more fruit so I resorted to using my oven for the purpose which, whilst not seeming nearly as romantic as the natural process, produced surprisingly good results. For me, this is great news because I like nothing better than opening a jar of preserved summer tomatoes in the depths of winter to give a punch of richness to soups, casseroles and pizzas. To oven dry your own tomatoes, simply take a kilo of ripe, plum tomatoes, cut them in half lengthways and place them on a baking tray, skin-side down. 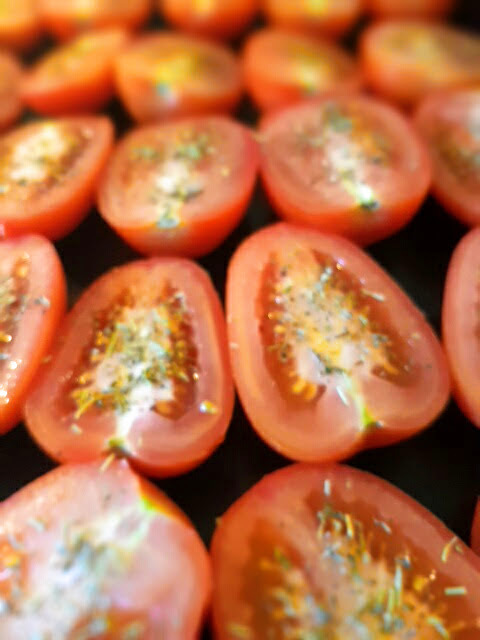 I sometimes sprinkle a pinch of herbes de provence over the tomatoes at this stage. Bake the tomatoes for four hours in a low oven at 120°C but keep an eye on them to ensure they don’t burn and try to pour off any escaped juice. After four hours the tomatoes should still have the aforementioned ‘squidginess’ and remain bright red in colour. Leave them to cool and either bottle as set out above or try my purée recipe below. 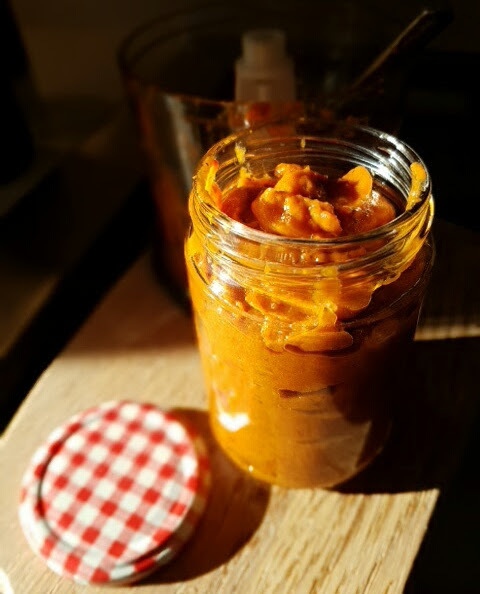 To make a standard sized jam jar you will need 200g oven-dried tomatoes (from a kilo of fresh, plum tomatoes). Put all the ingredients in a mini mixer and blitz them until they form a thick paste. You could add a handful of pitted, black olives to supplement the flavour. Spoon the purée into a sterilised jar and cover with a thin layer of extra virgin olive oil before sealing, Keep in the fridge for up to two months. Once opened, use within two weeks. I particularly like to add a dollop to meaty ragus or you could spread some across a roll of puff pastry then top with sliced salami, grated gruyère and olives before baking in the oven for 20 minutes to give a crisp, flavoursome tart.